Pictured, from left, are Morrow County Auditor Patricia Davies, Ohio Treasurer’s Office Public Affairs Liaison Mary Crall and Morrow County Deputy Auditor Pamela Davis. 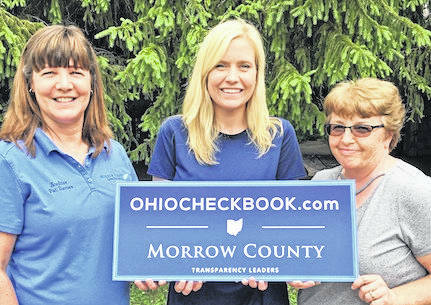 MOUNT GILEAD — Ohio Treasurer Josh Mandel announced June 19 the launch of Morrow County’s online checkbook on OhioCheckbook.com. Morrow County is the 38th county in Ohio to post their spending on OhioCheckbook.com. Morrow County’s online checkbook includes over 68,000 individual transactions that represent more than $80 million of total spending over Fiscal Year 2017. On April 7, 2015, Mandel sent a letter to 18,062 local government and school officials representing 3,962 local governments throughout the state calling on them to place their checkbook level data on OhioCheckbook.com and extending an invitation to partner with his office at no cost to local governments. These local governments include cities, counties, townships, schools, library districts and other special districts.